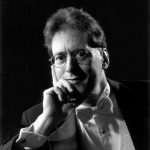 Robert Levin has performed through­­out the world with the orchestras of Atlanta, Berlin, Birmingham, Bos­ton, Chicago, Cleveland, Detroit, Los Angeles, Mon­­­treal and Vienna as well as with the Academy of Ancient Music, the English Baroque Soloists, the Handel & Haydn Society, the London Classical Players, the Orchestra of the Age of Enlightenment and the Orchestre Révolu­tion­naire et Ro­man­tique on period pianos. His recordings include all the Bach, Mozart and Beethoven concertos. A passionate advocate of new music, he has commissioned and premiered a large number of works. Robert Levin appears frequently with his wife, pianist Ya-Fei Chuang, in duo recitals and with orchestra, and with violist Kim Kashkashian. A noted Mozart scholar, his completions of Mozart’s Requiem and other unfinished works have been recorded and performed throughout the world. In 2005, his completion of the Mozart C-minor Mass, commissioned by Carnegie Hall, was premiered there and has since been widely heard in the USA and Europe. After more than a quarter century as an artist teacher at the Sarasota Music Festival, he became its Artistic Director in 2007. A member of the American Academy of Arts and Sciences and the Akademie für Mozartforschung, he is President of the International J. S. Bach Competition (Leipzig, Germany) and Professor at Harvard Uni­versity.